Miguel de Cervantes was born in Alcalá, Spain in 1547. Little is known of his early career. In 1571, he fought in Italy, where he was seriously wounded by harquebus shot and almost lost his left hand, and later participated in the campaigns of Juan of Austria. During the voyage back to Spain, he was captured by Algerian corsairs and spent five years as a slave in Algiers, during which he tried to escape four times, before he was ransomed and returned to his family. 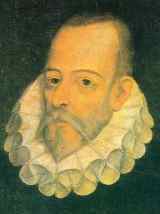 In 1585, a few months after his marriage, Cervantes published La Galatea, his first novel. At the same time, several of his plays, now lost, were performed in Madrid. Two years later he traveled to Andalusia, where he spent ten years and encountered money problems with the government that led to a jail term in 1597. In 1605, Cervantes returned to the literary scene with the successful publication of the first part of Don Quixote, his best-known work (which, tradition holds, he wrote while in prison). During the last nine years of his life, he settled in Madrid and continued writing various works, including the second part of Don Quixote, which appeared in 1615. He died April 22, 1616. Poor Alonso Quijano, insane after reading too many romance novels, decides to become a Knight. He takes old weapons from his barn and renames himself Don Quixote, and begins his adventures.